I recently applied to the Canon Professional Services (CPS) program and was approved at the Gold membership level for one year. I first learned about this program in a blog post by Ethan Meleg. I have to be honest, the Canon swag is what interested me at first. So what do you get as a Gold member to this program? 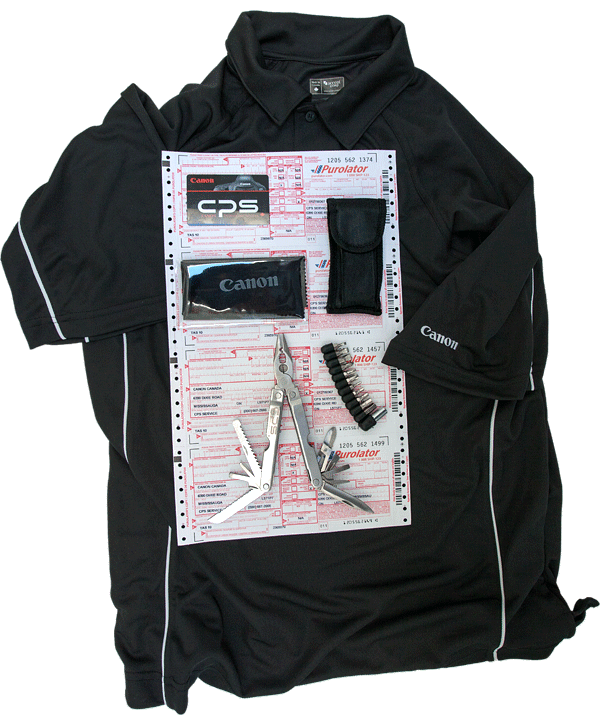 Once you are approved and have paid your $100 membership fee (Platinum members are $250) you receive a CPS welcome kit via Purolator. Included is your membership card and some Canon swag (more about this later). The membership card entitles you to preferred pricing on Canon products at photo retailers. Exactly how much you can save remains a mystery to me. I’ve read on a few sites that this means you get Canon products at the dealer’s cost. Apparently retailers don’t make a lot of money on camera bodies and lenses so the savings might not be very significant. Canon says that membership will “serve to identify you for service priority and discounts within the CPS program and for on site complimentary service support at events supported by Canon CPS services.” Sounds great but I’ve never had any problems with my Canon gear in seven years. Still, it’s good to know that I can get it back quickly if needed. I would love to know more about the complimentary service support at events supported by Canon CPS. There isn’t any mention of upcoming events on their website. Is it worth it? Yes, but only if you’re allowed two complimentary cleanings of your camera body as some websites have indicated. I’m trying to confirm this with Canon Canada and will post an update when I know. In the past I’ve paid $40 to have my Canon 5D cleaned professionally. Two free cleanings per year and the items in the welcome kit would make gold membership a good value. The member services section on the Canon Canada website doesn’t contain very much in the way of benefits unless rental rates and CPS service rates are of interest to you. Members are supposed to receive occasional emails about CPS program features and special offers. I’ll post an update when I find out about the camera cleaning issue and any other updates that might be of interest to Canadian photographers considering this program. Update: Canon Canada has informed me that Gold and Platinum members do not receive any free camera cleanings. Cleaning of CMOS sensors from Canon Canada is $40 CDN and gold members are given a 20% discount. In light of this information I don’t think the Canon Professional Services is a great deal.